said as she lay dying. as he has grown older and more feeble. he moved in with Sarah and her husband. All three get along well, mostly. with the increasing demands of her father’s care. She can seldom leave her home anymore. “I want to be a good daughter. I want to be true to my word. we read into it the second question. We want always to act in loving ways. We make sure to follow through. specially equipped, and physically stronger. 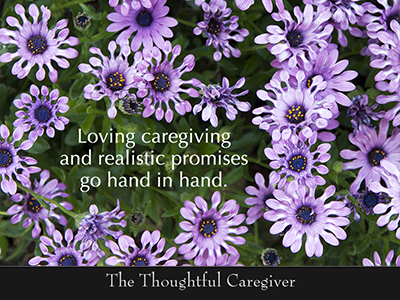 for us to remain the main day-to-day caregiver. for us as a dedicated caregiver. This entry was posted on July 30, 2007 at 4:49 am and is filed under Caregiver Truths, Caregiving Lessons. You can follow any responses to this entry through the RSS 2.0 feed. You can leave a response, or trackback from your own site. Thanks for the poem. Just just printed it, framed it and put it up on the wall!